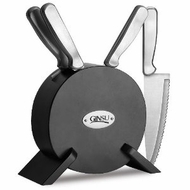 Ginsu knives have commercial quality, high carbon, Japanese stainless steel blades. Stainless steel handles are built for extreme strength and durability. Hardwood storage blocks keep your knives organized, safe and ready to use. This set includes: 3-1/2-inch paring knife, 4-1/2-inch utility knife, 5-inch santoku knife, 6-inch chef's knife, hardwood storage block.